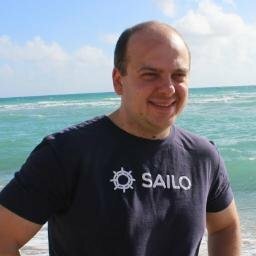 In this post we are talking to Adrian Gradinaru, co-founder and CEO of Sailo, Techstars ’15 company from New York City. 1. What is Sailo in 140 characters? Sailo is an online boat rental marketplace that makes renting a boat seamless, accessible and personal by connecting renters to boat owners and captains. Sailo’s three other founders and I are happiest when escaping chaotic city life and enjoying freedom at sea. We are not boat owners so we all rent boats to get out on the water. I have been frustrated by the cumbersome and antiquated rental process for a long time, and while in business school, after another really frustrating and failed rental attempt, I started exploring ways to make the process easier. So we decided to create Sailo.. Our mission is to get more people out on the water to discover the magic of boating. 3. What does your product do? Sailo takes the slow inefficient boat rental process and turns it into a seamless five minute experience. Today’s consumers are tech savvy and experience oriented. They want a wide variety of options and a hassle-free booking and trip. That’s precisely what Sailo’s online marketplace offers. Users can browse and compare boats based on location, price, number of people, type of activity they want to do and user experiences, while being able to pair up with a trustworthy crew. For boat owners, it’s the easiest and safest way to monetize their asset thanks to Sailo’s complete trip insurance and secure messaging and payment platform. 4. How do you acquire boats for your platform? We’ve tested many methods for boat acquisition (including online efforts as well as going to boat shows and meetups) and found the best way to get a boat owner on board is to explain Sailo’s value proposition. They are easy to convince since they understand and appreciate the new opportunity to monetize their underutilized assets. 5. How do people find out about Sailo? People find out about Sailo in many ways. First off, we have a local presence in the markets we are in and are constantly attending industry events or sponsoring charities. As a result, we’ve benefited from word of mouth exposure. Our customers create memories and unforgettable experiences that they share on social media outlets. (Boating makes for amazing photos. Visit us @SailoBoats on Facebook, Instagram and Twitter). Of course, Sailo can be found from searches and online advertising. We’ve also received wonderful print, online and video press from local, national and international media outlets, including: Fox News, Fortune, TechCrunch, Travel + Leisure, Maxim, Entrepreneur, Town & Country, and more. We’re grateful to be able to share our story and get more people out on the water! 6. What is unique about your approach to boat rental market? Sailo focuses on the experience, not the transaction. Everything we do is focused on how to make things easy for customers, including those inexperienced to boating. We help with trip planning and offer shared payments. That’s why we offer customer service to make sure renters and boat owners have the best experiences. We currently focus on a few key markets. This is deliberate so we can develop strong relationships with boat owners and choose the right partners before taking our playbook elsewhere. As a result, we have a well-curated inventory of well-maintained boats with top notch captains and superior service. We know firsthand what a transformative experience boating is, and we’re determined to share it with the world. Until now, boating has been considered an exclusive pastime only for a fortunate few who own or have access to boats. Intimidating yacht clubs or marinas leave outsiders feeling…like outsiders. Our mission is to make boating friendly and achievable for all. In fact, with Sailo, no experience is necessary. Sailo prides itself on expanding the market to non boaters. Sailo focuses on enriching the experience through technology. We’ve made it easy for customers to search and find their dream boat, including on their phones. In addition, we focus on the details of what makes a trip truly special by creating add-ons like catering or watersport activities. And, we realize that most of all we are helping our customers create memories. We encourage capturing special moments in time through Sailo’s social initiatives. 8. What is your advice to other founders? Focus, focus, focus! Determine your most important objectives and do not lose sight of them. It’s so tempting to listen to everyone’s advice, but it’s essential to prioritize and only do the things that will bring you closer to your goals. In particular, focus on customer experience. At Sailo, our end goal is to make people happy. We keep this in mind in everything we do, from designing a user-friendly website to creating awesome itineraries for a perfect day out on the water and everything in between. Customer feedback is key to constantly improving. In turn, phone calls from customers saying they had the best day of their lives is what makes US happy.